Over the course of the last thirty years, each new version of Windows OS has brought new features that provided new possibilities to PC users. Each new iteration of Windows has made the task of editing a photo a little easier, and today editing images on Windows 10 is both simple and fun. If you are looking for a powerful tool that will let you manipulate your pictures in any way you want, but you don't want to use the Adobe Photoshop, you've come to the right place, because in this article we are going to take you through some of the best photo editing programs for Windows 10. Selecting the photo editing software requires you to take into consideration a lot of different factors, and we used the following criteria to choose the six best photo editing programs for the latest version of Windows. Modern and Intuitive Interface - The software's interface is important because if the program isn't easy to navigate through, some less experienced photo editors will have a tough time finding the right tools to edit their photos. Complete Editing Features - A photo editor that doesn't provide a lot of options, can hardly be called a good photo editing tool, and for that reason features an editor offers are criteria that mustn't be disregarded. Retouch with Minimum Effort - Photo editing process can be time-consuming, which is why our list only features the photo editing software that actually saves time and allows you to edit your photos with ease. Affordability - As great as Adobe Photoshop is, it is still quite expensive, and the software's price always plays a big role in the process of choosing the right photo editor. 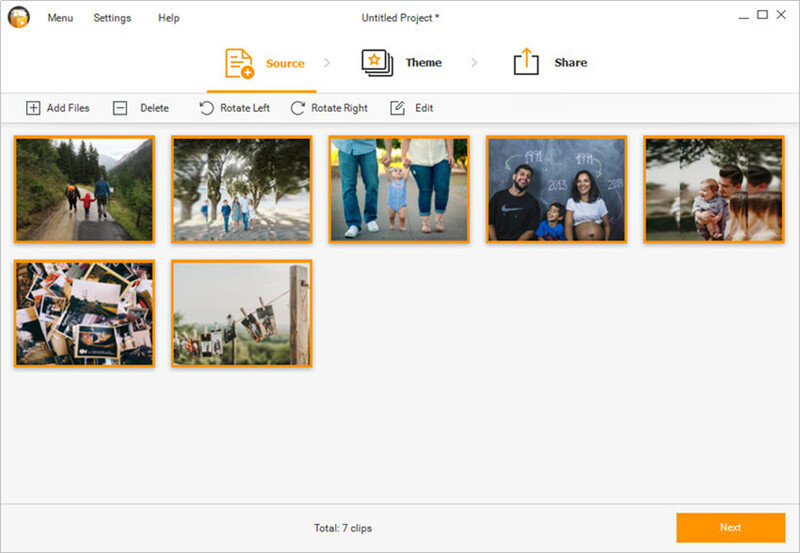 All Wondershare's software is well-known for its simplicity and ease of use, and Fotophire photo editor is certainly not an exception. Its modern and intuitive interface, the number of tools it offers, price and the fact that editing a photo with Fotophire is a straightforward process, suggest that this photo editing software is the best alternative to Adobe Photoshop on Windows 10. The amount of options provided by the Fotophire is simply staggering since this photo editing software allows you to remove image background from your photos in a few clicks , erase objects without affecting the background or apply over 200 photo effects, such as filters , overlays and frames . Pros - An extensive list of features that enable the software's user to perform nearly all photo editing tasks. Cons - Fotophire has three different modules that must be launched separately, and the installation process may take time. This desktop app has first become available for the Windows 8.1 and in recent years, it has become one of the best and the most popular options for PC users who want to save time on photo editing. Autodesk Pixlr lets you perform all of the basic photo editing actions like cropping or resizing images. Furthermore, the Splash feature allows you to enhance the colors in your photos, while the Effect option lets you set the atmosphere of each and every image you edit with this app. Autodesk Pixlr is a great option for inexperienced photographers and photo editors who would like to familiarize themselves with the world of photo editing. Pros: Editing a photo with Autodesk Pixlr requires a minimum amount of effort, and the app can be downloaded for free. Cons: The lack of advanced photo editing tools limits the number of things you can do with this app. Besides being one of the best online photo editors, Fotor is also among the most powerful alternatives for Adobe Photoshop on Windows 10. This photo editor is equipped with all the tools you'll ever need to create a perfect selfie because its Wrinkle Remover or Teeth Whitening features let you have complete control over the tiniest details in a photo. The process of editing a photo is further simplified by an impressive number of effects, borders and other settings that are incredibly easy to use. The upgrade to the Pro version of the software is completely free. Pros: Besides being available to everyone, Fotor is also a photo editing software that provides amazing tools for image manipulation. Cons: Creating multi-layered images may prove to be a difficult task. The popularity of this open source photo editor indicates that the professional photo editing tools it offers are nothing short of amazing. If you are a skilled photographer or a graphic designer then you are going to have a great time using this program because it allows you to save and share the innovations you make on its source code. Gimp or GNU Image Manipulation Program offers limitless photo editing possibilities, which means that you use it to experiment and improve your image making skills. However, the abundance of options this photo editing software provides may be too much for people who are just looking for a fast way to edit a photo. Pros: The photo editor provides nearly endless photo editing options, and it even lets you create your own artwork with the graphic design elements. Cons: Gimp is not an easy-to-use software. Everyone who chooses to download this amazing app from the Microsft Store can produce visually stunning photos. Fhotoroom offers support for a large number of image file formats, including RAW, TIFF or JPEG files. You can adjust color values with the Color Correction and Exposure tools, while an impressive amount of HDR filters allows you to find the best mood for each image you process with this app. Importing images into this photo editor is easy since the Windows 10 version of Fhotoroom lets you drag and drop pictures directly from a folder on your hard drive. Pros: You don't have to worry about making mistakes, because Fhotoroom lets you Undo as many actions as you want, and you can also see the full History List. Cons: Background removal tools are scarce. PicsArt is much more than just an average photo editor because it also features the tools that enable you to draw, paint and even make collages. This all in one photo editing app for Windows 10 lets you create double exposure photos, use stickers or add text to your photos. PicsArt is equipped with over a thousand editing tools that can be used to create any kind of photo you want. By downloading this app, you will become a member of a large community that might help you find inspiration for your creations. Pros: PicsArt makes photo editing fun, and the tools it provides enable you to experiment freely. Cons: In-app purchases are required if you want to gain access to all tools this app has to offer. Regardless of the camera, you use to take photos, you will need a reliable photo editing software to edit your images. Each of the photo editors for Windows 10 we mentioned in this article, presents a good alternative to Adobe Photoshop and provides the photo editing tools that will enable you to produce breathtaking images. Let us know in the comments which photo editing software you like to use the most. 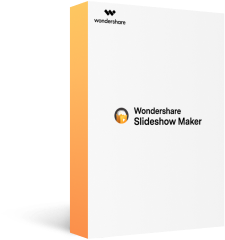 Fotophire Slideshow Maker, an easy-to-use but powerful slideshow maker program, will help you to make a photo or video slideshow in 3 easy steps. The program can help you to get the work done easily, and it offers 26 templates for you to choose. In this part, we're going to show you how to use Fotophire Slideshow Maker to make a slideshow in detail. Drag and drop the photos or videos into program window directly. Click the big + button in the middle of the program window to add photos or videos. Click the Add Files button at the upper left corner of the program window, and choose Add Photos or Videos to add files. After adding the photos or videos into the program window, the program will display all the files and allows you to edit them. After adding files into the program, you can click the Next button at the lower-right bottom or Theme at the top middle to enter the theme-selecting section. You can choose the templates you want, and you're allowed to choose from the following categories: Popular, Kids, Birthday, Family, Holiday, and Memory. 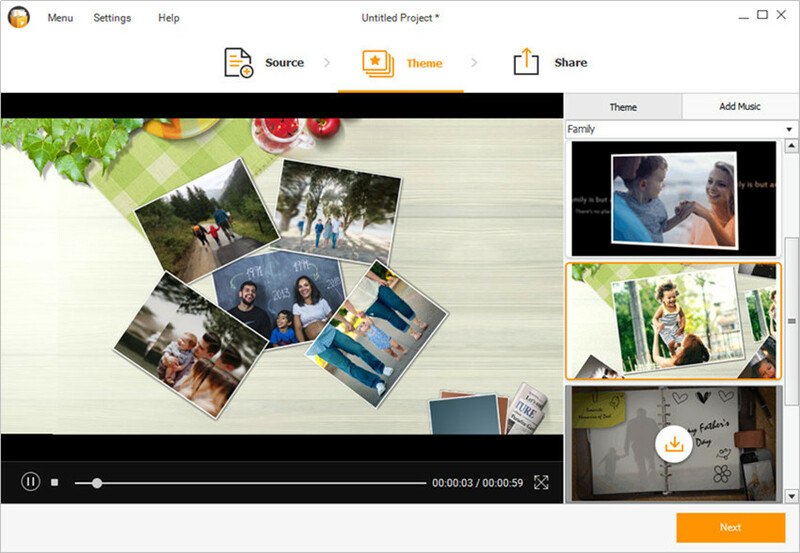 After selecting the theme for your slideshow, you can save or share the slideshow video. 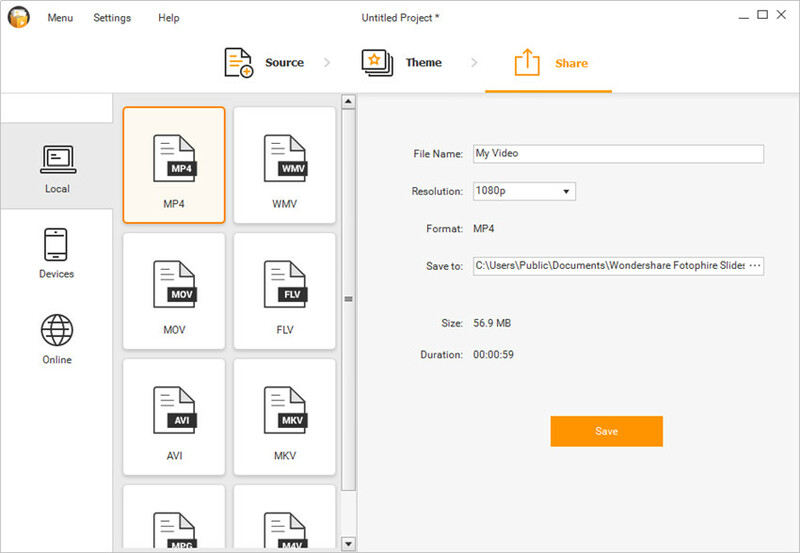 Fotophire Slideshow Maker provides you multiple video formats for output, and it enables you to share the slideshow video to YouTube in one click.